My boss says, “What happens in Vegas stays in Vegas!” every time I’m leaving for one of these conferences. At first, I thought it was him telling me, “Have fun!” with a famous slogan, but now I’m starting to think it’s a subtle way of him expressing, “Please stop coming back. I don’t want to keep paying for your cross-country flights.” I can imagine you thought you’d gotten rid of me and my daily conference posts too, but alas, here I am, and you best believe I have a flight home booked for tomorrow night! This week I’m at The Sales 3.0 Conference. This conference series offers insight, strategies, and practical solutions to help B2B leaders in sales, sales operations, and sales enablement compete in a digital, tech-driven era. Speakers reflect a unique mix of thought leaders, powerhouse motivators, analysts, and successful sales leaders. 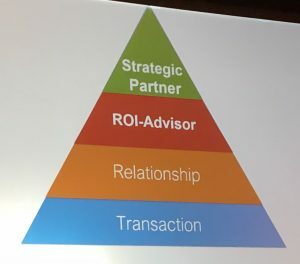 There have been A TON of great sessions with countless snippets of helpful information, but I think I can bucket everything I heard today into three categories: (1) Today’s Sales and Sales Enablement Landscape, (2) Challenges in Sales and Sales Enablement, and (3) Solutions to Our Challenges. The digital age is here, and it’s not going anywhere. Scott Collins, Vice President of Advisory at Gartner, says that it’s an “inescapable evolution.” 93%, 94%, and 83% of B2B buyers use digital channels in the early, middle, and late stages of their buying journey, respectively. This promotes a tough buying environment for sellers: bigger buying groups, overwhelmed buyers, “good enough” buying, and stalled deals. Empowered buyers are becoming overwhelmed buyers, with too much information and too many stakeholders, leading to stalled deals or no decision at all. An evolving response to the tough environment is marketing and sales investments in digital capabilities. According to a survey conducted by LinkedIn, companies spend $15B on sales training, and $800B on incentives to retain sales talent. Mindset: Either you sell or you are being sold. Prospects are targets. Beliefs: Buyers need to be told before they can be sold. My money is in the customer’s pocket. Behaviors: Talks fast and too much. Poor listener. Always under high pressure. Mindset: Positive about people. Driven to Bond. Nice and easy does it. Beliefs: Relationships are the key factor. If I am not liked, I am a failure. Behaviors: Schmoozing. Avoiding challenging customers. Mindset: Positive about ROI. Driven to prove. Selling is creating value. Beliefs: Value Seller. Solving a problem is the key to success. Asking the right questions leads to the right solution. Behaviors: Diagnostic skills. Solves business problems. Differentiation. Mindset: Business improvement catalyst. Driven to partner. The trusted partner wins. Beliefs: I create massive value. Strategic partner. I leverage all support systems. Behaviors: Okay, I’ll be honest… I didn’t write quickly enough to get this part of the presentation in my notes. But! I think we can assume that some of the behaviors of a strategic partner might be demonstrating roadmap alignment, building trust, proving value delivered, etc. Low adoption of CRM leads to failure. Organizations with less than 25% CRM adoption have 80% lower win rates and quota attainment rates. Salespeople need better access to data. Just 23% of salespeople say they have access to a single comprehensive view of customer data. Lack of Time. 40% of a sales manager’s time is spent on forecasting. Management doesn’t have enough hours in the day to inspect every deal and join every sales call. Unpredictable Forecasts. 30% of committed deals slip. Continuous Data Swings. Management has no visibility into which deal changes cause the biggest swings in pipeline. ValueSelling Associates also states, “Over 65% of sales leaders feel they’re losing business because they don’t have a compelling value proposition.” All sales teams are defeated on a daily basis by No Decision. Doing nothing is the biggest competitor around. There are thousands upon thousands of “different” solutions. To the supplier, the differences between your solution and your competitions’ are obvious. To the buyer, it’s just not that easy. In order to win more deals at higher prices we must create, capture, and communicate our value. Sales teams at market-leading companies have consistent selling behaviors from rep to rep. The best organizations have salesforces full of Strategic Partners that are business improvement catalysts, driven to partner, and trusted by buyers. If you win trust with the buyer, the sale will be successful. Someone who sounds competent, confident and on your side wins your trust. Automate the selling experience. Spend more time selling. Eliminate guesswork. Increase revenue. Optimize sales processes. Go from tactical to strategic. Drive the right behaviors. Faster, accurate planning. Deliver a better customer experience. More meaningful and responsive engagement. The right products, at the right price, at the right time. Stay tuned for more from my experience at Sales 3.0, and in the meantime check out how LeveragePoint helps empower sales conversations with our digital, interactive tool.